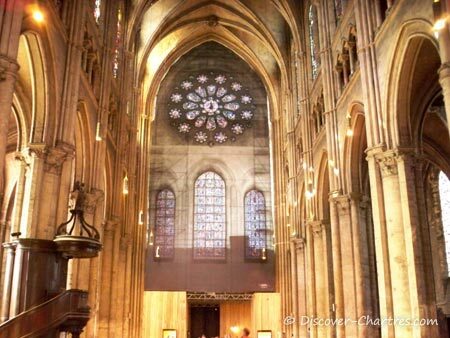 I must admit that I couldn't find Chartres labyrinth in my earlier visits to Chartres Cathedral! And this was really made me so upset! So I went to Chartres Media library and borrowed some books about the cathedral. Finally, I discovered that the labyrinth is situated on the central nave. But how could I didn't see it? I went back to the cathedral and this time I checked very well and make sure that I would not miss something. And yes...I found the labyrinth! It is hidden under the cathedral chairs. Actually I found it by accident... I saw two visitors who was walking among the chairs and bowing their head just like searching for something. 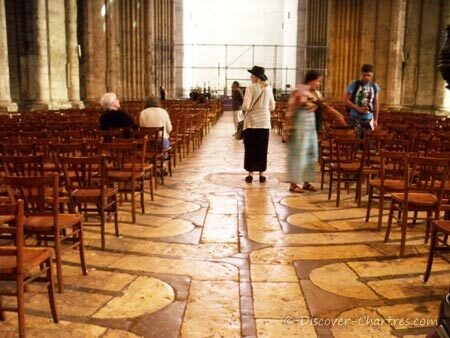 I looked at them quite a moment about what they were doing until I understand that they were trying to walk the labyrinth which covered by cathedral chairs at that time. 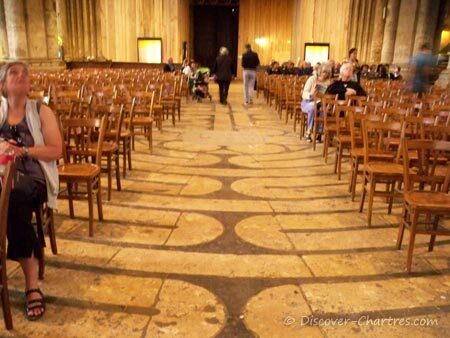 Now I can say to you that if you enter Chartres cathedral from the Royal portal, you will be able to see the labyrinth on floor in the center of the nave. 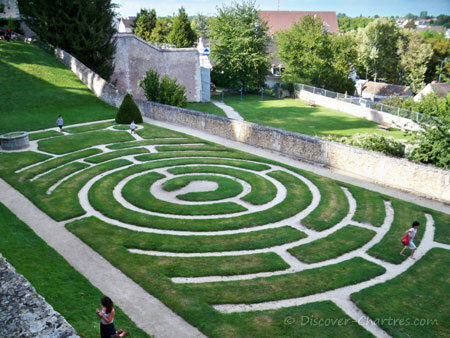 Chartres labyrinth was built from limestone in early 13th century. It is no doubt one of the ancient part of the cathedral. With approximately 13 meters diameter, the labyrinth takes place the entire width of the central nave. It forms more than 261 meters pathway. Different sources mention different number of measures related to this labyrinth. And personally I never had my self doing the measure of it. If you wish to know further, Jeff Saward explain more details about the size and shape of Chartres cathedral on Layrinthos website. From the labyrinth, you could see the other side of the rose window and three other windows below it. If you notice really well, you will find out that the roses window has almost the same size as the labyrinth. If you ever wonder why there is a kind of metal filter that covers the windows as seen on my picture above... It is because Chartres cathedral is under restoration by the time I took this picture. I think the windows should be uncovered soon after finishing the works. Many visitors come here with the purpose to walk the labyrinth. They believe that the labyrinth could be useful for healing and meditation. Some group of tours even especially arrange for these activities. The labyrinth is not available for walking all the time. The ranks of chairs which cover the most part of the labyrinth will give you the difficulty to trace the pathway. There are the moments when the labyrinth is free from the chairs so visitors could walk the labyrinth. However these schedule are subject to change. If certain cathedral services like pilgrimage, weddings and funerals take place, they will interrupt the schedule during one or two hours. However, if you wish to walk the labyrinth, I recommend you to check out first the actual schedule and come at the right time. And please note that the schedule could be change anytime at the last moment. 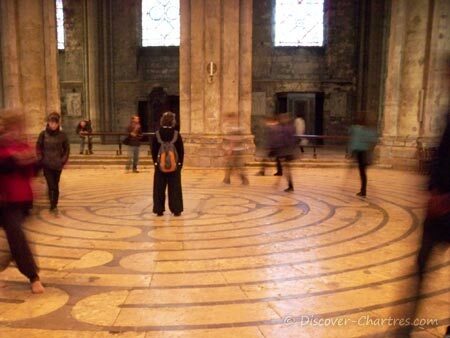 Chartres cathedral labyrinth opens for walking every Friday from 10am to 5pm, from Lent (between February 20 and March 20) until All Saints' Day (November 1). The labyrinth garden is a part of Bishops Palace garden. You will find this garden just behind the cathedral on the lower land. Please yourself by walking this labyrinth garden if you ever come not in the right time... when Chartres cathedral labyrinth is uncovered.